Chincherinchee are a spring flowering bulb, they have large flowers especially the ‘Giant Chincherinchee’ are a hardy plant. Flowers are generally white with green centres. Great for for the the border, with flower spikes ranging from white through to primrose shades. Excellent in the border planted in a clump and equal as home in a container. 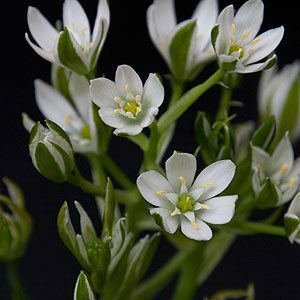 The botanical name is Ornithogalum thysoide and they are just one of the large Ornithogalum genus. All parts of the Chincherinchee plant and the bulb are poisonous. A well mulched soil with lots of humus and a sunny position. Drainage is essential especially in winter months. In the garden plant the bulbs at around 10 cm apart and at around 5cm deep. Flowers will appear in spring and at this time a liquid fertiliser should be used.